Isiah Thomas talked about team reclaiming its bravado, and that surely means playing unrelenting defense. 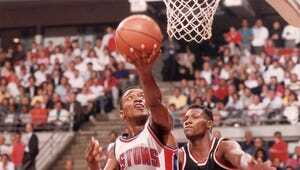 Auburn Hills — Isiah Thomas was back at the Palace on Wednesday. Paying his final respects, if you will, as the Pistons’ run nears an end here where all those championship memories were created. But as the Hall of Fame legend reminisced about the good ol’ days of the Bad Boys — on a night where he was honored with a special halftime ceremony during the Pistons’ 121-102 win over the Lakers — Thomas was asked to assess the current tenants. How good does the Pistons great think this team really is? But too many times on too many nights, they haven’t, which helps explain the Pistons’ place in the standings — clinging to eighth place in the Eastern Conference despite a 25-28 record — and, to an extent, all those empty seats in the building this franchise used to fill. “They’ve struggled to find that bravado again,” said Thomas, who sat courtside with Palace Sports & Entertainment vice chairman Arn Tellem and shared some laughs with Dave Bing and Earl Cureton, among others. “I mean, sincere bravado, not make-believe bravado. That guy has started to emerge the last month or so, and Wednesday it was Johnson’s play off the bench to start the second quarter — five points, three assists and a blocked shot in seven solid minutes — that helped spark the Pistons after another slow start. And against one of the league’s worst teams — the Lakers are now 6-24 on the road this season — the Pistons did manage to avoid a trap they’ve fallen into regularly this season. Already they’ve lost games to Brooklyn, Phoenix, Philadelphia, Orlando, Milwaukee, Sacramento and the New York Knicks. They know they can’t afford many — or any — more stumbles like that the rest of the way. But Wednesday, they handled their business, and handled an inferior opponent again, giving the Pistons their fourth consecutive win at The Palace — they routed a shorthanded 76ers team Monday — and seventh in the last eight on their home floor. Five of the next seven on Detroit’s schedule are here at The Palace as well. And though the next one against San Antonio on Friday, there’s no good reason this Pistons team shouldn’t be back to the .500 mark by the end of February. Only if they stick to the script, though. A couple weeks ago, Van Gundy handed his players a laundry list of areas that needed improvement if the Pistons were going to find their way back to the playoffs. A “syllabus” is what Johnson called it. And at the top of the list, not surprisingly, was defense, pressuring the ball and communicating like a team that’s hardly a bunch of strangers. The team’s defensive rating that ranked among the NBA’s top five in the first quarter of the season had faded into mediocrity — or worse — over the next 20-plus games. Against the Lakers, they “didn’t come out ready to defend,” either, Van Gundy said. But after starting the game 8-for-10 from the field, Los Angeles shot just 38.1 percent the rest of the night. And among the notable performances at that end were arguably the two most important players on the Pistons roster. While Jackson didn’t light it up offensively, Van Gundy offered some unsolicited praise for his work defensively on DeAngelo Russell, fighting over screens and helping limit the Lakers’ second-leading scorer to just two shots — and two points — Wednesday. “I thought it was maybe his best defensive game,” Van Gundy said. Andre Drummond had one of his better games as well, and beyond the 24 points and 17 rebounds it was the four blocked shots and three steals that stood out. “When I play like that defensively it really gets everybody motivated and everybody excited to play,” Drummond said. Wednesday, there was a little extra motivation, too. And it was no accident that among the admiring crowd during the halftime ceremony was the Pistons' newly anointed franchise player. Drummond left the locker room early and plopped down on the home team’s bench to watch the tribute video and Thomas’ interview with George Blaha. And to their credit, the Pistons played like they meant it.